We met up with Li Brannfors and friends Jen and Jasper who kindly let us stay with them in their South Rim national park lodgings. Today was a lovely relaxing day, catching up with things on the internet, eating lots and generally chilling out. We reserved a campsite at Cottonwood Campground for our intended crossing of the Grand Canyon tomorrow to the North Rim. Well, it was almost booked out, but we got a place in the overflow mule area! Alarm at 4.30 am Utah time (3.30 Arizona time!). Thanks to Li for a great stay! Off hiking around 4.20 in the dark to reach the rim of the canyon again to start descending the Bright Angel trail into the canyon. 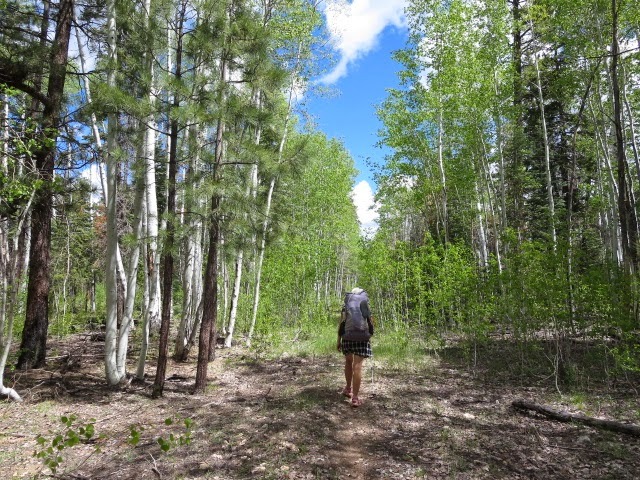 We dropped height easily on a zigzagging path in a valley, soon heading into the shade of beautiful green cottonwoods and flowing water at Indian Creek campground. 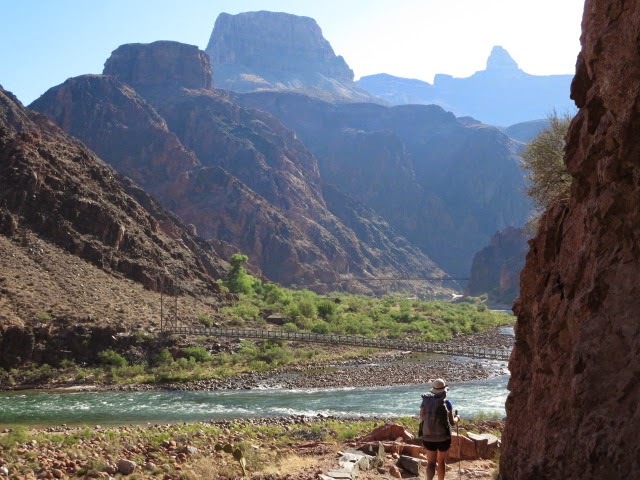 Following good trail down easily into the inner gorge of the canyon led us into different rock types of schists and granites to the Colorado river itself. We were able to cross the river on a suspension bridge here and hiked a short distance to Phantom Ranch (this is a park lodge and campsite set in a deep side canyon near the bottom of the Grand). We made it by 8.20 am after a 10 mile easy, scenic and enjoyable descent. 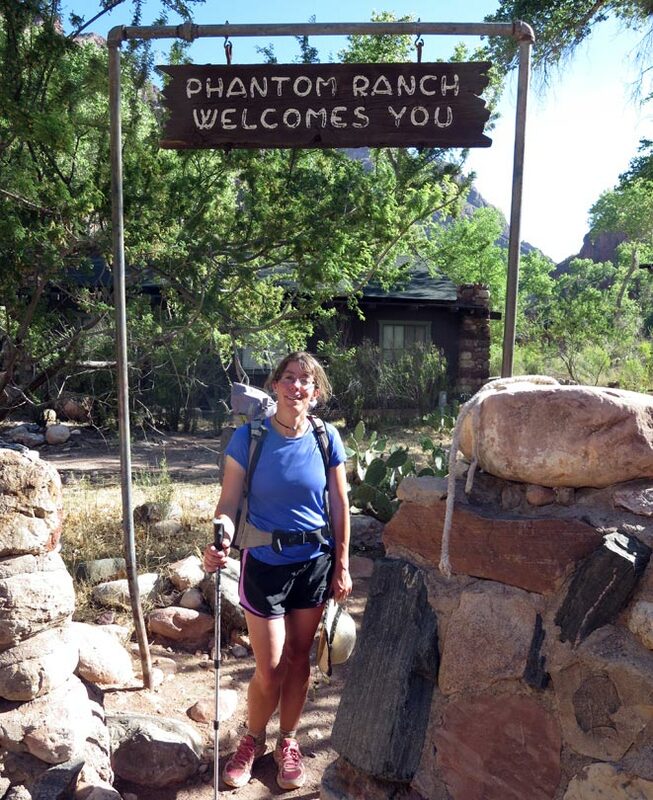 Both glad to have started so early though as it was already roasting (maybe 30 C) at Phantom Ranch even this early. Picking up water, we had a look at the canteen and 1920’s style chalet buildings which all look pretty nice. 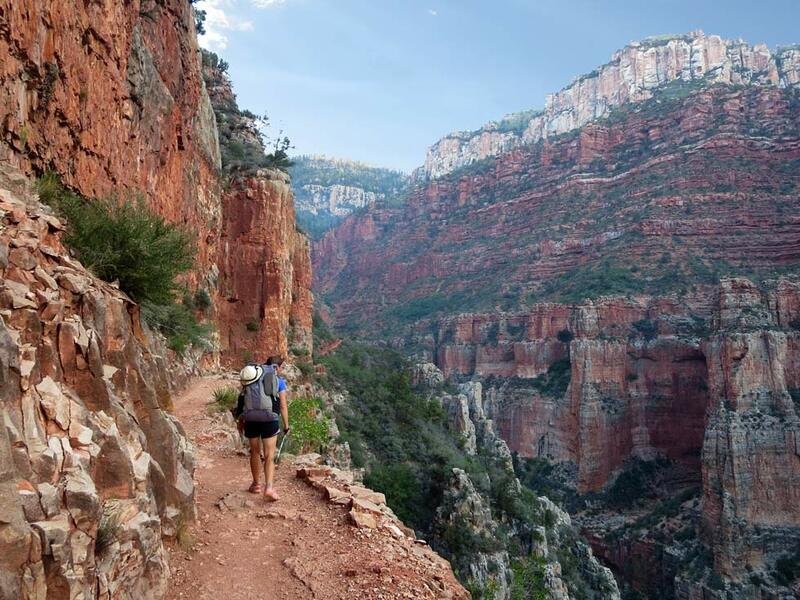 But we headed on and now had the uphill part of the day ahead of us climbing towards the North Rim of the canyon on the popular North Kiabab trail. The hiking was on good trails, firstly following a stream flowing through a deep canyon made of ruptured schists and pegmatites- this rock scenery was very much like that in Scotland and was familiar to us! The heat really cranked up though after about 1 and half hours hiking when the valley opened out and we had less shelter from the sizzling sun. A stop in the shade by the river revived us after we soaked our T-shirts in the river and wore them wet to cool us a little. It worked! It was a relief to stop at a waterfall – ‘Ribbon Falls’ at 11 am for another cool down. We hid there from the sun for almost 6 hours under a deep mossy overhang with stalagtites; reading, dozing and chilling out under the waterfall. Some wild mint made for delicious tea and we had some frogs for company – perfect! Our thermometer recorded 36 C in the shade. Eventually in the evening we hiked onwards, climbing up to Cottonwood campground which remained uncomfortably hot into the late evening. It was uncomfortably hot overnight and at 3.30 am it was still 24 C and we decided to get up and hike on. Leaving at 4.20 am in the dark felt good and the trail was clear with head torches- climbing upwards towards the rim at 9,000 feet where we hoped it would be cooler! Above Roaring Springs the light crept in and the scenery was beautiful with red rock walls and a ‘Dolomitic’ style trail traversing cliff edges. We made it to the top at the North Rim after about 3 hours and it was refreshingly chilly – it felt good to wear a fleece again. 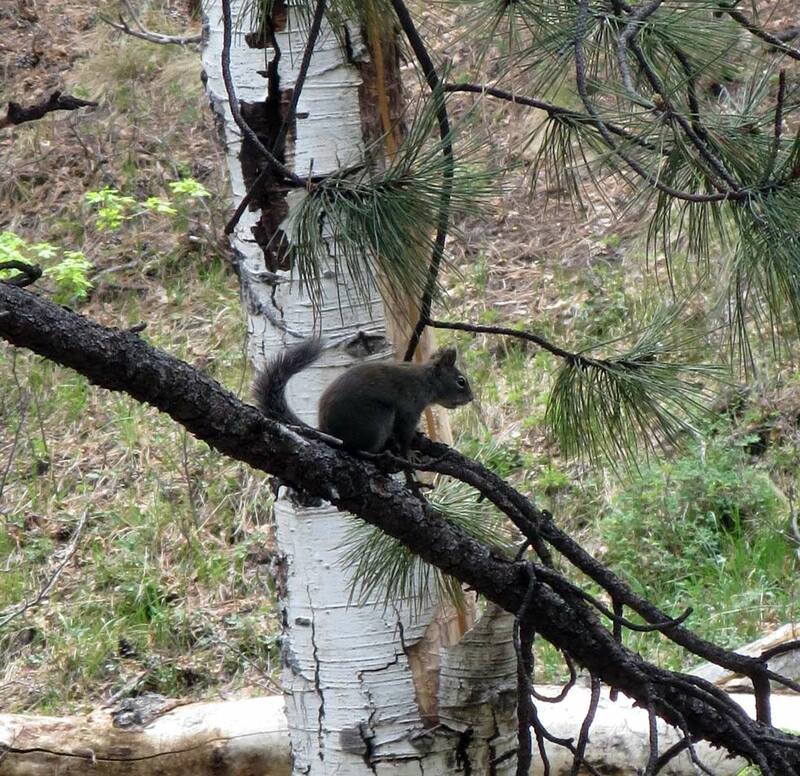 Also there was Ponderosa, White fir, Douglas fir and Aspen trees around, a great contrast to the dry inner Grand Canyon. North Rim has a national park visitor centre, lodge, campsite and lots of tourists but is quiet compared with South Rim and we liked it. We find the laid back campers store and have a relaxed coffee and cake on the veranda- excellent! Our dinner was a luxury mix of Idaho mash potato, black beans and salad, washed down with a bottle of Chardonnay- way hey! A campsite talk by park rangers on bats ends a wonderful relaxing day after the early start. 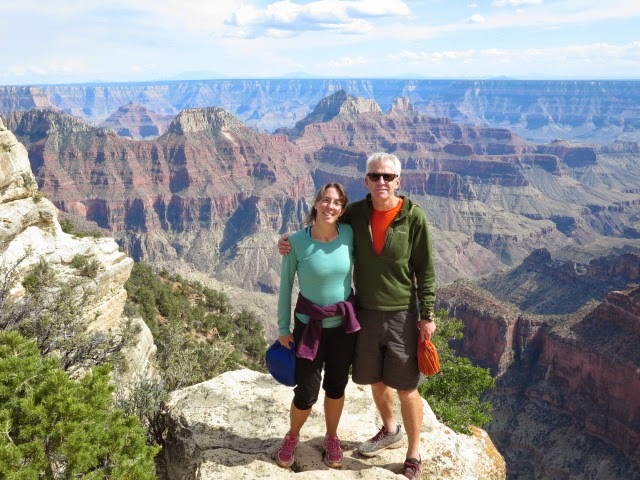 We were both happy to chill out today and take a stroll around the North Rim of the Grand Canyon for the views. The evening park ranger talk is ‘Ravens’ – a specialty and love of Martina’s! 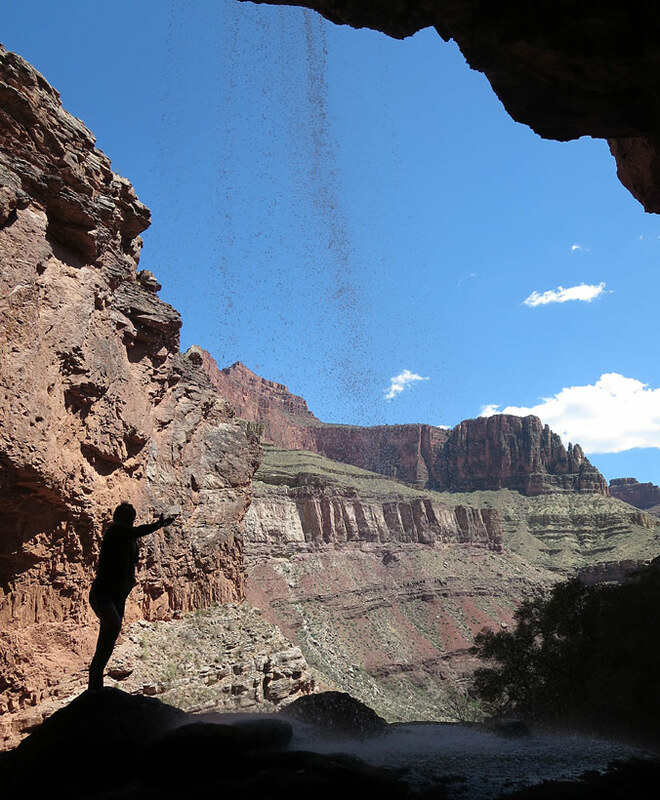 The heat of the inner Grand Canyon had been getting to us and we agree not to do the next section of the Hayduke which descends back into the canyon for a particularly tough hike where we felt that the heat would prevent us enjoying the marvelous scenery. We will need to come back earlier in spring or in autumn some day to do that!!! Instead we decide to hike out north on the Arizona Trail tomorrow to the National Park entrance to complete a loop hike in the Grand Canyon National Park. Then to hitch back to near Zion National Park to do the final two days of the Hayduke Trail. It’s disappointing not to continue on the Hayduke but we would have been miserable hiking in these hot temperatures. After posting our ‘float box’ of spare supplies at the PO to Zion National Park, we hike north at around 9.40 am on the Arizona Trail. 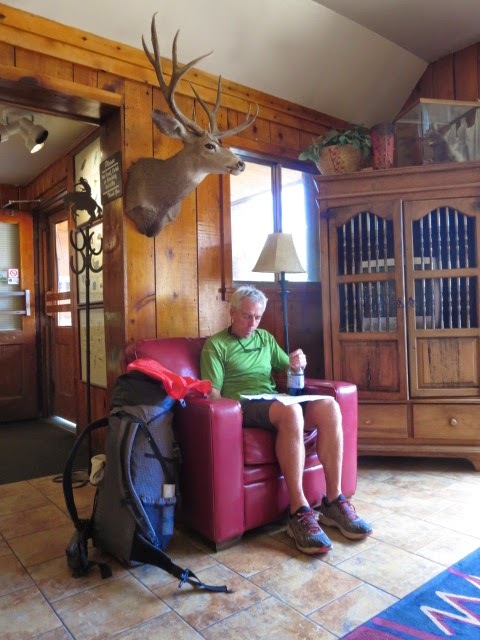 It was easy going through green forest of aspen and ponderosa in cool conditions at 9,000 feet – hoorah! We caught up with another hiker- Shawney(? 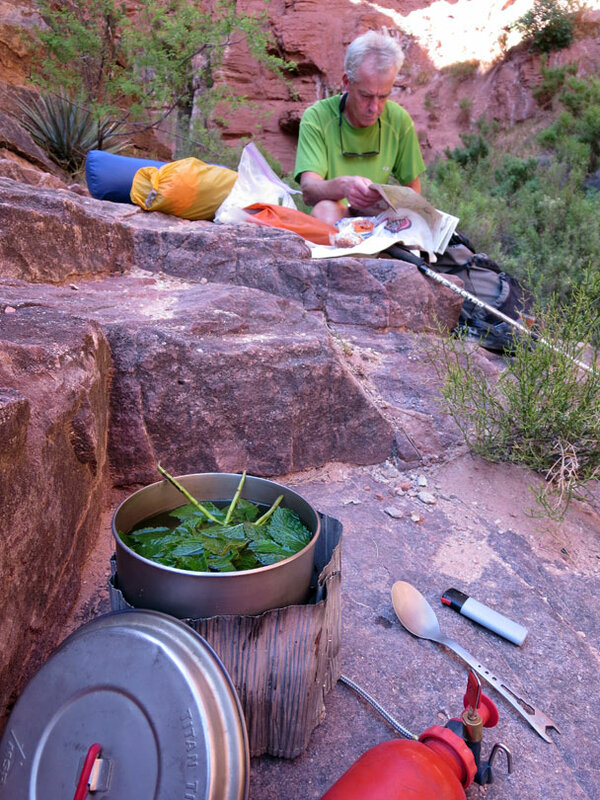 )- running the AZT, covering 30-45 miles per day. We caught him at our walking pace because he had run up from the bottom of the Grand Canyon in the morning and had now slowed down after that huge climb. After a fun chat we leave him and hike on and reach the north entrance of the park where we quickly hitched a lift north to Jacob Lake resort. We took a day off today as Martina was feeling ill and we lucked out with a direct hitch to Kanab health centre (thanks!) and got taken straight away, diagnosed and antibiotics administered- our travel insurance was worth the money!